Due to variations in computer monitors, color management settings, ambient lighting and other factors, the colors in online proofs are for reference only and do not perfectly represent actual screen-printed designs. 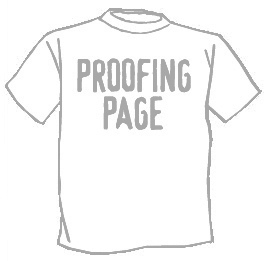 Our proofing section is invaluable for viewing the overall look and feel of artwork, checking spelling and design placement, as well as providing a general idea of the size of the print relative to the garment. When preparing screens for printing, we use our best judgement for the size of the screen-printed design, based on our experience printing hundreds of thousands of T-shirts for many satisfied customers. If your design needs to meet rigorous sizing or placement specifications, please discuss the issue further with our staff.